Before automated hardware & software solutions existed like the Little Bramper, GBTimelapse, Promote Control, Ramper Pro, Timelapse+ VIEW, and qDslrDashboard we had to manually ramp our exposure between sunset and dark night skies for holy grail timelapses. Today many automated intervalometers like the ones mentioned above make this job a lot easier! But what if you have a camera that is not supported, such as a Fuji, Leica, or Olympus? Here’s a handy spreadsheet to help with the calculations. Most camera meters cannot measure below 1 or 0EV, and so they will not push your exposure long enough for dark night skies like the Milky Way—which is about -6 to -7EV for a good exposure with no light pollution or moonlight. 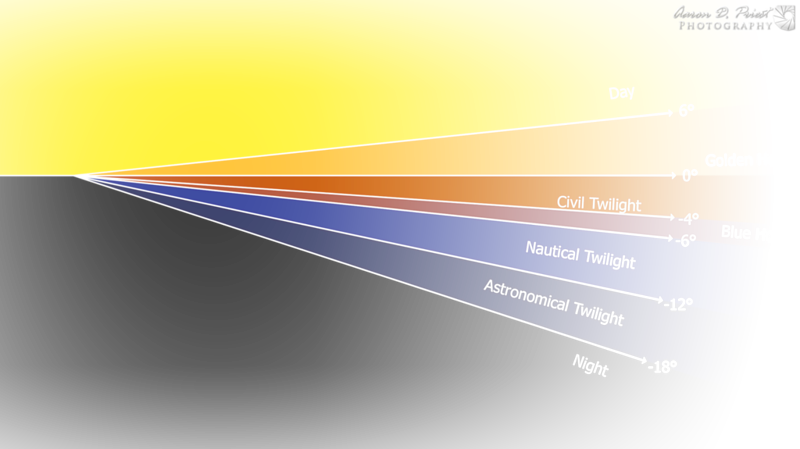 Civil twilight is typically about 2 to 3EV for my geographical area, depending on cloud cover, weather, and compass heading. For sunrise ramping, use the beginning of astronomical and civil dawn; for sunsets use the end of civil and astronomical dusk. Civil dawn is roughly half an hour before civil sunrise, and civil dusk is roughly half an hour after civil sunset, when the sun is 6° below the horizon. Likewise with astronomical dawn/dusk where the sun is 18° below the horizon. You can look these specific times up for any geographical location with ephemeris apps like PhotoPills, PlanIt!, and TPE. Just be sure to use the start of civil and astronomical dawn for sunrises, and the end of civil and astronomical dusk for sunsets. You'll be manually ramping between these two times where the sun is 6° below the horizon to 18° below the horizon--when the sky is as dark as it is going to get (assuming no moon that night). During the day and through civil twilight after sunset you can use aperture priority and let the camera handle the metering. During the rest of the night you'll have a fixed, static exposure unless there is a moonrise. Some camera models like the Nikon D810 and D750 have an exposure smoothing feature that can be enabled in the intervalometer to keep the camera from excessively bouncing the exposure around while shooting a timelapse with the camera's meter. This will help a lot when editing later so I recommend enabling it if your camera has such a feature. 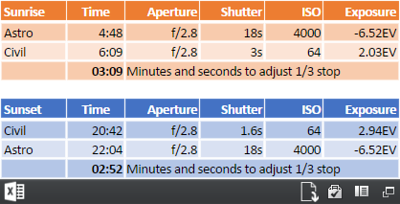 It will only matter in metering modes like aperture priority, not manual exposure or manual ramping where the meter is ignored, so there is no harm in leaving it enabled all the time. You'll also want to use manual focus and manual white balance. You can ramp the white balance later while editing, and thus you also want to shoot in RAW mode, not JPEG. I recommend disabling auto ISO as well. You won't need to raise your ISO during the day or during civil twilight in aperture priority mode. Make sure the interval on your intervalometer is a few seconds longer than your longest exposure during the night. Some cameras require entering a menu to change the ISO, and you want to give yourself time to do this between shots! When you start ramping manually, gradually increase your shutter speed first in 1/3 increments until you hit your maximum desired shutter speed for sharp stars, and then start increasing your ISO in 1/3 increments until your scene is bright enough or you hit the maximum ISO you are comfortable with as far as noise goes with your sensor. For more information about recommended high ISOs, maximum shutter speeds for sharp stars, and tips about night photography in general, check out this article on Night Sky Photography. To edit your RAW files into a nice timelapse sequence, I highly recommend LRTimelapse. You will have 1/3 exposure jumps throughout your footage as you manually ramped, and you'll want to edit this into a nice, smooth ramp with no transitions. If you used aperture priority during the day and civil twilight, you'll have to smooth this out a little bit too. The developer, Gunther Wegner, has some excellent tutorials and videos on his website. Thanks for reading and feel free to share this page with others! Happy shooting!! !